Would you like some small fries? No, I’m not talking about the food! 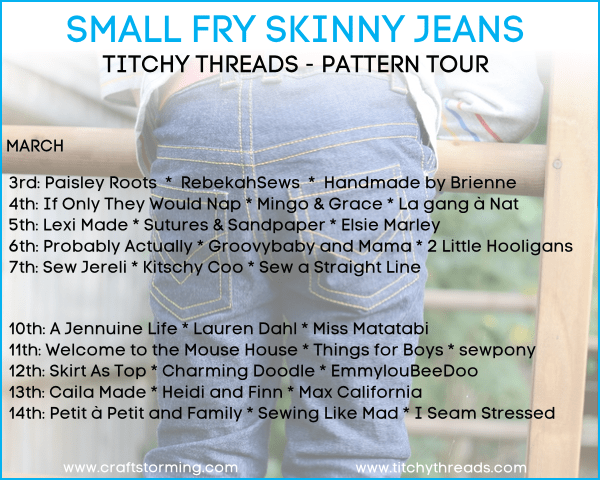 Awhile back I tested an awesome pair of pants called the Small Fry Skinny Jeans by Titchy Threads. Now I have the honor of being on the pattern tour! My first pattern tour! Woohoo! So let me tell you about these jeans. 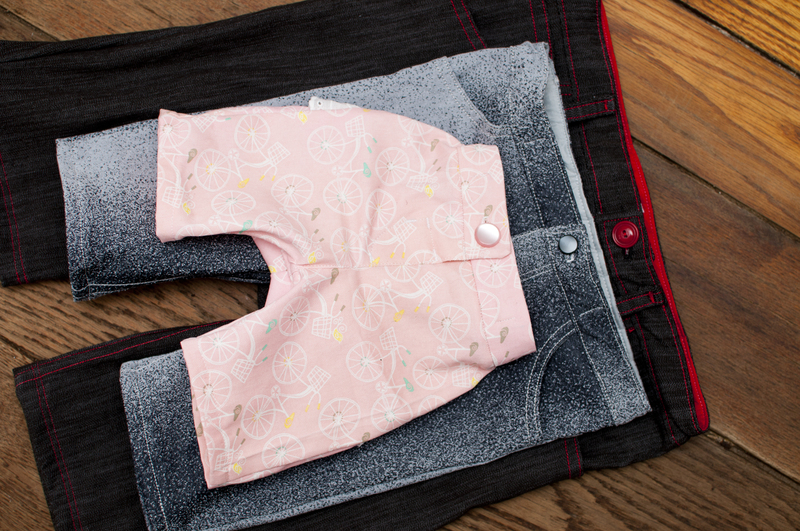 Not just jeans, mind you, as the pattern comes with shorts length too. And not the short shorts length, but the ever trendy Bermuda length which I prefer. It comes in two size ranges, 0-3mo-3T and 3Y-12Y, which is perfect as my kiddos are all over the place! Now if you look at the pictures before buying the pattern you may be thinking, “There is no way I could make these, looks too complicated.” Have no fear my friend. The tutorial walks you through step by step so you can achieve any options that are included, such as the flat felled seams, half faux fly (my favorite as my kids don’t seem to like zipping their flies up! ), zipper fly, topstitching, inset or patch pockets and adjustable waist. Seriously, when you are done you will look with awe on your jeans. I know I did!! So professionally finished that you will get the “Really?” from others when you tell them you made them! Want to know another great feature that I have yet to see anyone else provide with their patterns? Layers in the PDF pattern! This means that you can select just the size you want to print. No more line confusion!! Now let me show you the awesome options I chose. 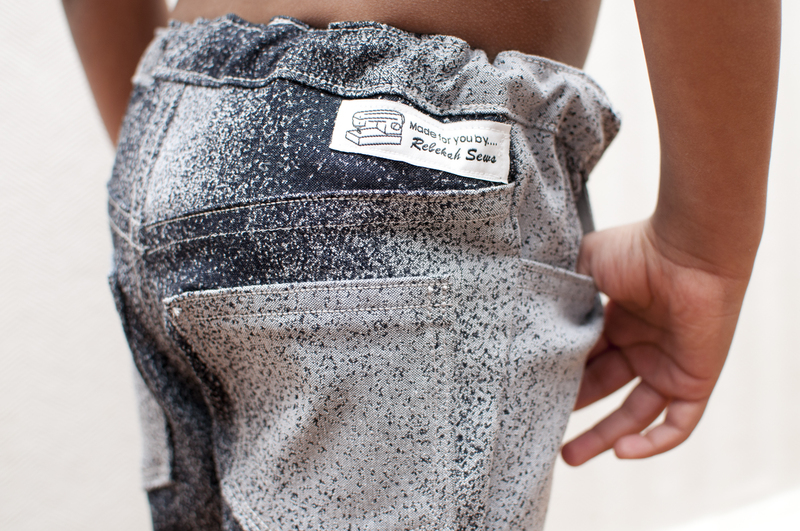 At first I was going to make just classic jeans and add a reinforced knee or knee patches. However I am soooo longing for warmer weather that I figured if I started on the kids’ summer wardrobe then it will come sooner, right? One can hope. Three pairs of shorts it was! For the oldest I made a size 12 as he is a big 6yr old who just keeps growing despite my wishes for him to stop. I chose the inset pockets with coin pocket, and the topstitched waistband with no elastic. The belt loops are big enough for belts so at his age I don’t really feel he needs the adjustable waist. He was very excited to get these with the red topstitching! It’s his favorite color! For my middle man a size 4y fit him just perfectly. I also did inset pockets but no coin pocket as I didn’t want to be trying to dig tiny rocks out of it! Yes, he loves collecting them. I did do an adjustable waist on this pair, but no belt loops. I love the ways to make this pattern your own just by adding or omitting options. Last but not least was the pair for the little princess. Now ever since I got this pattern I have been dying to try it in non-stretchy material. The pattern calls for stretch denim, twill, etc as these need to stretch a bit in order to fit properly as they are skinny jeans. Well I have this very cute pink bicycle fabric that I just was dying to make a pair with, and you guessed it; it has no stretch. Well now was the time to try it. I decided to go up a size in order to give more room and in hopes that she would get more use out of them as she keeps growing. Well it worked! They fit and are so cute. 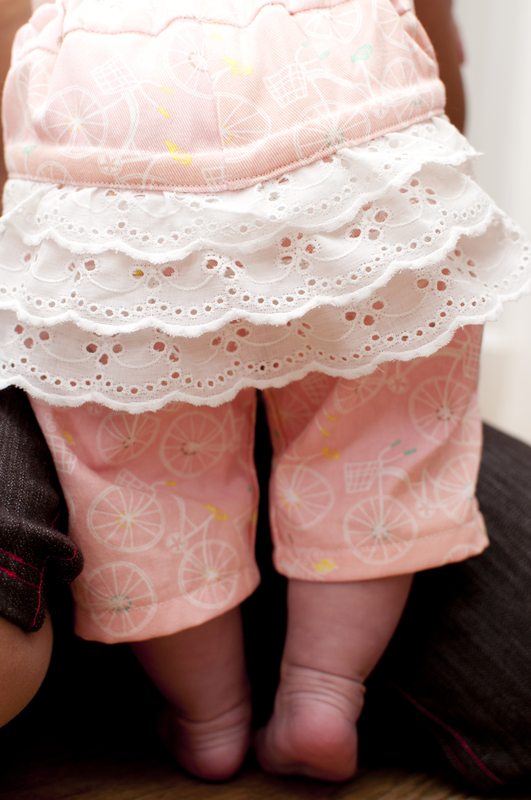 I even added eyelet across the bum because who doesn’t love a ruffle bum? In order to do this though I had to reorder the back construction steps. Very easy to do! I am just in love with these! So, have I convinced you that you need this pattern yet? Maybe a discount code would? Till the end of the tour you can get 20% off with the code TOUR20. Now, if neither I nor the code convinced you that you have to try this pattern, then I’m sure you will be fully convinced by the end of the tour. I can’t wait to see everyone else’s creations. I always get the best inspiration from others! So click below and enjoy the tour! Awesome job topstitching! Love all three pairs. The ruffles are adorable. I love how each of the pairs you’ve made are so different. They all look fantastic. Thanks for joining the tour today! Wow 3 pairs!! I love the fabric for the 4y, I can never find such awesome fabric for boys. The ruffle bum is such a clever idea. I love all of them! Super cute! and your photos too. 3 pairs! Nice effort! It’s hard to pick a favourite. The little ones with the ruffles!! !” OMG – so cute! Way to go making THREE pairs of jeans! Hats off, I mean ON, to Whimsy Couture! Ruth's First Birthday Bash! Review Time!